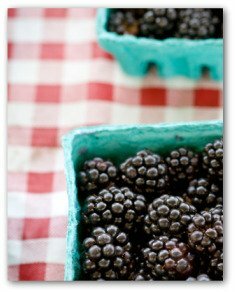 Easy tips for planting blackberries when home vegetable gardening can ensure success. Learn when and how to plant, care for, and harvest blackberries grown in a backyard garden. This delicious berry is great for eating fresh, is easily frozen for winter use, and of course makes great jelly, pie, and cobbler for your family to enjoy. Plant blackberry plants early in the spring. Most nursery blackberry plants that you purchase will have a 6 to 8 inch dormant cane extending from the root ball. Dig a hole larger than you need to hold the root ball. Mix some compost and fertilizer with some of the soil, and put it back in the bottom of the hole. Plant the blackberry plants one inch deeper than they were previously grown. Press the damp soil firmly around the roots of the plant. Water enough to settle the soil. Plant at least 3 feet apart in the row, and leave 7-8 feet between the rows. Be sure to water the plants frequently as they are getting established. Once the plants are fully grown, they will need regular watering of 1-2 inches per week just like the rest of your garden. The plants can be watered with a soaker hose, or drip irrigation system. 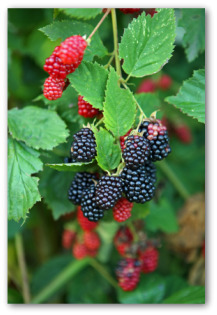 After sowing blackberries in fall, springtime, or during mild winters, they reach their peak in June, July, and August. The plants require full sun in colder climates but also need some shade in hotter regions. Make sure to plant the bushes where they have room to roam. It is recommended to transplant one year old plants since it takes two years for bearing fruit. Blackberries suffer stunted growth, wilting, or even death if they come in contact with black walnut roots. When deciding on a location for planting blackberries, allelopathic reactions occur within a circle one and a half times the distance from the trunk of the black walnut to the outermost branches. The tree suppresses neighboring plants by releasing into the environment a substance that inhibits the growth of potential competitors. A soil pH range within 5.5 to 6.5 is acceptable when planting blackberries. Transplant dormant suckers in a row from 4 to 6 feet apart. Mulching the plants conserves moisture and controls the weed population. Expect to be watering the bushes at least once a week and maybe more often during dry spells. Mark it on your post-planting blackberries gardening calendar that new plantings will require feeding every two months February through September. Feed new plants with three ounces of 8-8-8. Give mature vines five ounces per plant in February, with additional doses in June, and late August. Avoid planting blackberries where any plants of the nightshade family, which are peppers, tomatoes, potatoes, and eggplant, have been grown within the last couple of years. These crops can transmit verticillium wilt to blackberry plants. If the leaves of your blackberry plants become dwarfed and twisted, and a white powdery fungus develops on the undersides of leaves, they have the plant disease called "powdery mildew".Prune and destroy the infected parts. To combat powdery mildew, apply a 95 percent wettable sulfur fungicide every 7 to 10 days until systems disappear or until a month before harvesting begins. Thin plants to let in sun and air. Disinfect your pruning tool in a bleach solution of one part household bleach to four parts water after each cut. The best remedy is to plant disease resistant plants. For example, varieties such as Boysen, Ebony King, Eldorado, Lawton, Orange, Evergreen, Russell, and Snyder are resistant to orange rust disease. Yellow dots on both sides of leaves indicate this plant disease. Several weeks later, light colored areas develop on the undersides of leaves. Then the surface of the leaves rupture, exposing large, bright orange-red powdery masses of spores. Dig up infected plants and destroy them. For prevention, follow good fall cleanup practices and remove any wild berries growing nearby. One way to keep birds away from devouring all of your delectable berries is to plant borders of chokecherries, dogwood, mountain ash, mulberries, or other very aromatic types of fruit nearby. Birds seem to prefer eating them, and may leave your blackberries alone! The most enjoyable part of planting blackberries is harvesting the fruit. 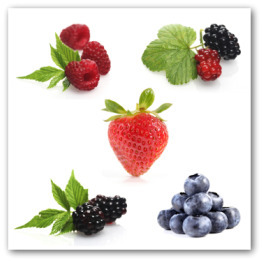 If any berries make it into the bucket instead of your mouth, you can expect a yield of 1 ½ to 2 quarts per plant! 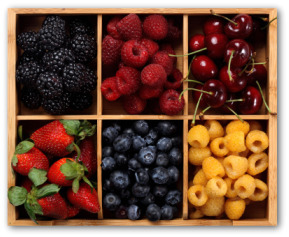 Store berries in the refrigerator immediately after picking to maintain flavor. Berries freeze well and will last up to 6 months frozen. Gently rinse the berries if they seem dusty or dirty, and allow them to dry before placing them in airtight containers in the freezer. The second best long term storage method is making blackberry jams or jellies.